Sentinel Rock offers the best view of the Franz Josef Glacier for the least amount of effort. In military speak a sentinel is a guard who stands watch over a nominated area. This glacier smoothed outcrop of schist bedrock quietly watches over the Franz Josef Glacier Valley and Waiho River. An easy ten minute climb will reward you with spectacular views of the Glacier. Sentinel Rock is a roche moutonnée or 'rock sheep', a block of schist shaped like a tear drop that was strong enough to withstand the relentless pressure of the glacier. The trail zig zags steadily through the regenerating bush to the viewing platform where you can see rata and kamahi trees surrounded by a carpet of moss and lichen on the bedrock. If you look to the Fritz Range on your right Mt Roon which is 2233 metres and Bismarck Peak 2545 metres are easily identified on a clear day. This rock emerged from beneath the retreating Franz Josef Glacier in 1865. 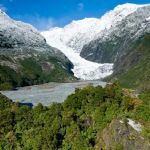 Since its unveiling the glacier has retreated a further two kilometres and plants have progressively regenerated in the area. From the view point, looking up the glacier valley you can see Teichelmanns Rock on your left. This is another roche moutonnée or 'rock sheep'—a block of schist shaped like a tear drop that was strong enough to withstand the relentless pressure of the glacier. Dr Ebenezer Teichelmann was a surgeon, explorer, mountaineer, photographer and conservationist who spent over forty years roaming the West Coast with Cannon Newton and the Graham brothers. He was part of the team that was first to climb Mount Aspiring. Like explorer Charlie Douglas, he has a peak, track, rock, and creek named after him. Teichelmann was born in Southern Australia in March 1859. With his German Father and Scottish mother it seemed he was bred for the mountains! In 1897 at the age of 38 he arrived in Hokitika as the surgeon superintendent at Seaview Hospital. He also used his skills in World War I in Egypt, France, Greece and Britain. During his lifetime he was a member of the Arthur’s Pass National Park Board, Lake Kaniere Scenic Reserve Board and President of the NZ Alpine Club. He died peacefully in 1938.